VFX Showreel 2011-2013 + Breakdown from Leon Loukeris on Vimeo. Since 2011 till now i joined Pixomondo Shanghai working as FX Lead for Feature Movies. 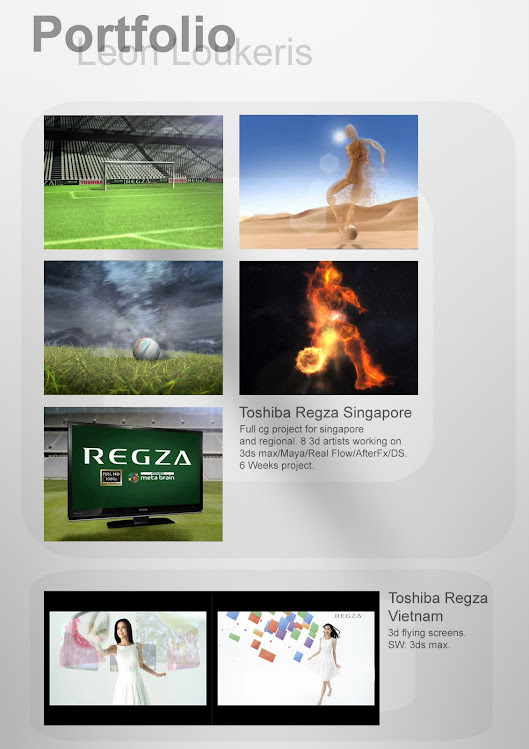 More than 14 years experience creating, supervising and directing 3d tv commercials for China,Greece,Vietnam,Singapore. Graduating from Akto Art & Design School Of Arts (Athens ) in 1999 i started the 3d department in one of the biggest and oldest Production Houses in Greece with in house post production. 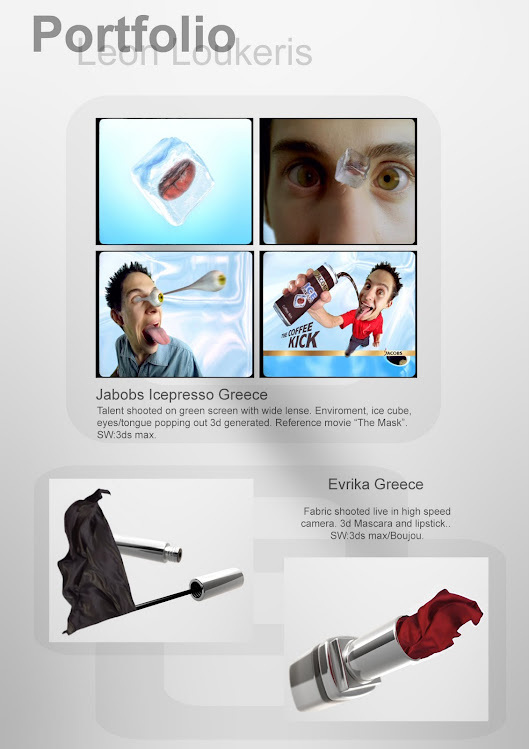 Mainly was used 3ds max but many tv commercials of the first 2 years have been created in Maya. 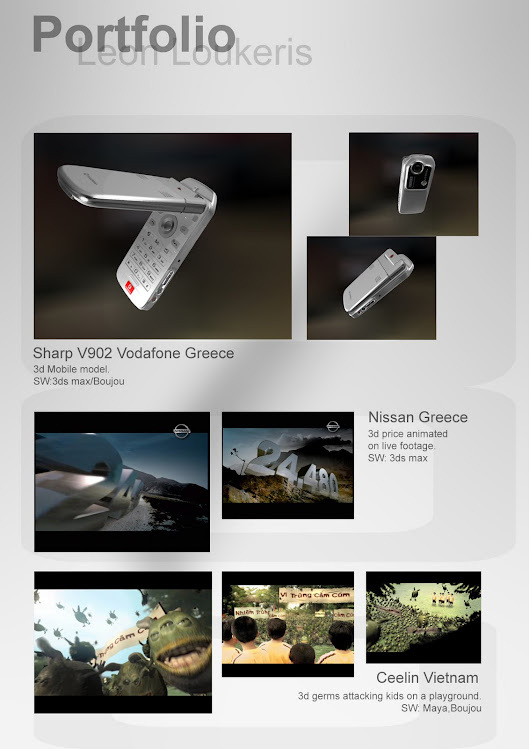 For around 9 years i participate in 200 tvc's mostly for the Greek market and some International. Clients like Coca Cola, Procter, Kia, Vodafone and 2004 Olympics are some names in a long list. In April 2008 came an offer from a Singaporean company Digipost for the position of the 3d supervisor in Vietnam and occasionally in Cambodia and Singapore. The challenge was accepted immediately and in July 2008 i joined Digipost Vietnam. 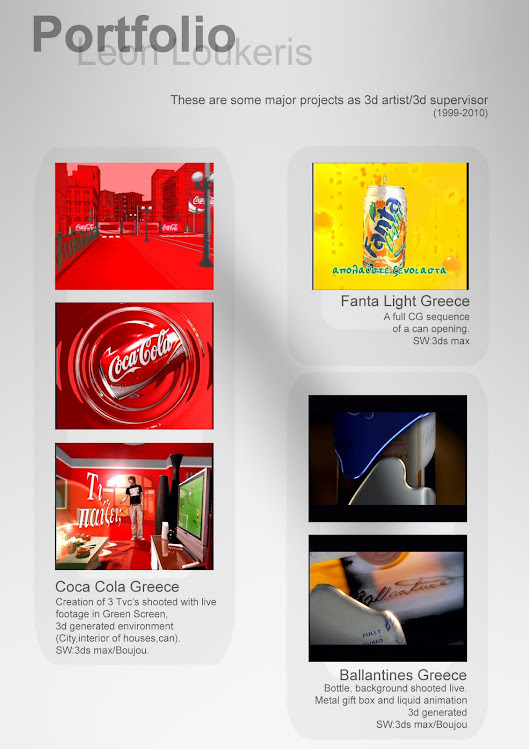 For the next 2,5 years the 3d and motion graphics department has been working in more than 150 tv commercials, such as: Toshiba, Coca Cola, Chin-Su, Nivea, Hazeline, Milo etc. Mostly of the commercials were for Vietnam but some of them were for Singapore (Growie, Toshiba, Aetos, JTC, Lux) and for Cambodia (Coca Cola, Unicef, Randonal). Supervising a team from different nationalities such as Vietnamese, Belgian, Malaysian, Pakistani and Cambodian was quite challenging and a really good experience for how to approach each person according to his way of thinking and working. In May 2011 i joined Pixomondo Shanghai. I was fortunate to work right away for Hugo as FX artist, which won the Oscar in Visual Effects category. 3 more movies followed, Snow White and the Huntsman, Racer Legend and till recently Star Trek Into Darkness, plus one episode from the tv series Game of Thrones. I had the opportunity to work for local tvc's and german as FX Lead/3d artist or as VFX supervisor (Indochino).